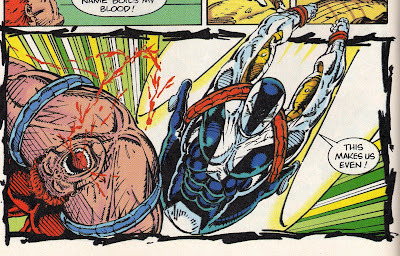 Welcome to I Love Rob Liefeld, a blog about comic books. Yes, you read that correctly. I Love Rob Liefeld. For those of you who do not know, Rob Liefeld is a comic book artist who was incredibly popular in the early- to mid-nineteen-nineties. Among other accomplishments, he created Cable for Marvel Comics before co-founding his own comic book company, Image, which grew to rival Marvel and DC, the top two comics companies, during the comic book boom in the nineties. He is well-known for an exaggerated art style that emphasizes muscle size and weapons at the expense of proper anatomy, and commonly is criticized for being unable to draw feet. Many comic book fans hate Rob Liefeld. They hate his drawing, his personality, and his presence at the epicenter of the nineties comic book boom and bust. If you read his Wikipedia entry, you'll find an entire section devoted to "Criticism," with its own sub-sections of "Art style," "Lateness," "Accusations of plagiarism and disputes of credit," and "Personal acrimony related to departure from Image comics." But, as I stated above, I love Rob Liefeld. Here is why: he got me into comics. 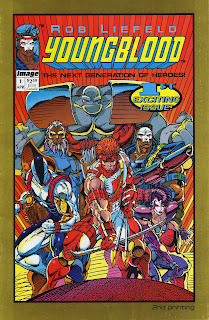 This is the cover for Youngblood #1, Rob Liefeld's first creation for Image. It stars a team of super-heroes employed by the United States government. They fight people. Youngblood #1 was published in April of 1992, when I was fourteen years old and in high school. Notice the ugly gold border? That was added for the second printing of the book, because the book sold out of its first printing. Like everything being published by Image at that time, this book was hot stuff when it came out. Prior to this, I wasn't really interested in comics. I had a few old ones lying around that I liked, but comics hadn't really grabbed me yet. Then, at the recommendation of a friend of mine who was into comics, I bought Youngblood #1 and my eyes were opened. The first issue introduces the team, and they immediately jump into action fighting a group of evil villains. I loved the whole issue. I couldn't wait to read more. I started buying other Image books. I started buying books from the other companies: Marvel, DC, and another new company called Valiant. Comics engulfed me. Every week at the local comic book store, I would spend every dollar that I earned from my minimum-wage video rental store job. I pored over the pages for hours, reading and re-reading, putting each comic in a bag to preserve it for more reading later. I would copy images from the books. I would talk about comics with my friends. I bought and read as many comics as I could get my hands on. I loved comics. And I have Rob Liefeld to thank for that. So that is why I love Rob Liefeld.